This weekend rocked. Literally, I was rockin’ out the whole time. When I have a bunch of freelance design work ahead of me I will download a plethora of new music and get cruising. Time seems to fly with new tunes. I am currently jamming to: Fleet Foxes + the new Mumford & Sons album. This whole music kick started when I discovered this time lapse video on Vimeo. Seriously, go watch all of this guys videos. Yes, every.single.one. It is well worth your time. I am a huge sucker for a time lapse, I might have to make one for you all soon! I won’t lie to you, I get most of my music from Vimeo videos. I found bands like: Afterklnag, The Paper Kites, Beirut and Katie Herzig. Now go forth and gather up some new music for yourself. You deserve it! You are so cute! I love this outfit. 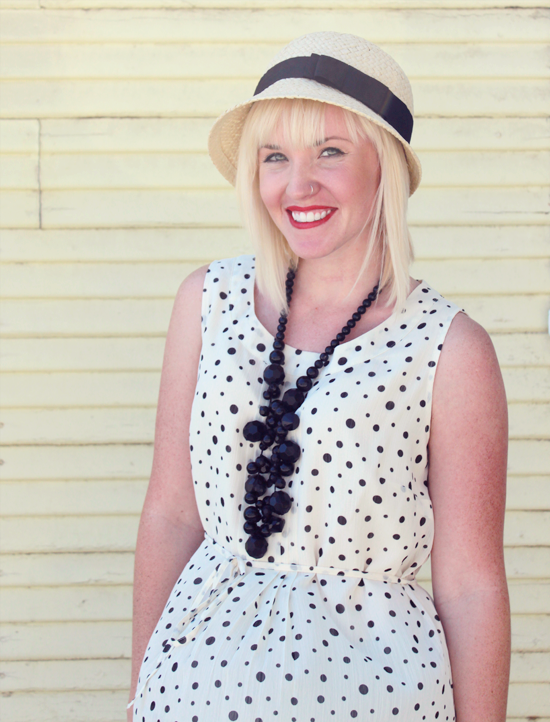 The polka dot top and the necklace go perfectly together. And the hat is just adorable. How cute are you!! Love this! 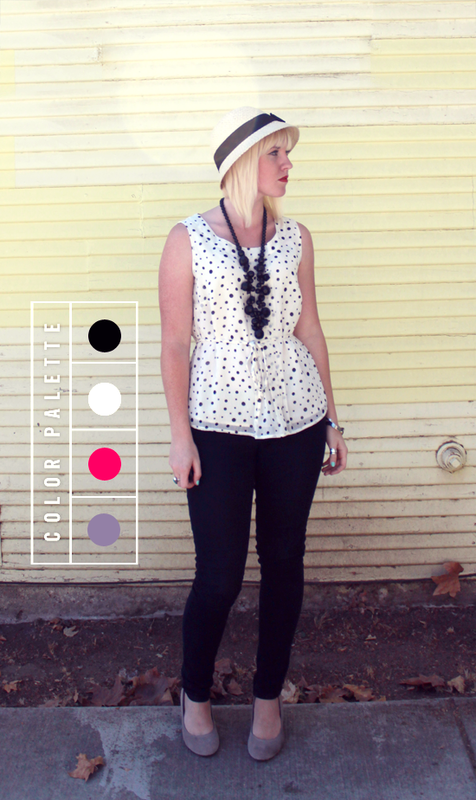 I love all the colors in this outfit and am wishing I could steal your hat! what a cute little hat! I love how it recalls eras gone by. I love this outfit and your taste in music. I am a sucker for peplums and polka dots so your top has stolen my heart! Thanks for stopping by my blog and I’m so glad to be following you. I must have missed this top at Target:( What a shame because it is adorable! I absolutely love this look on you. Black and white combos are always my fave. You look so cute! 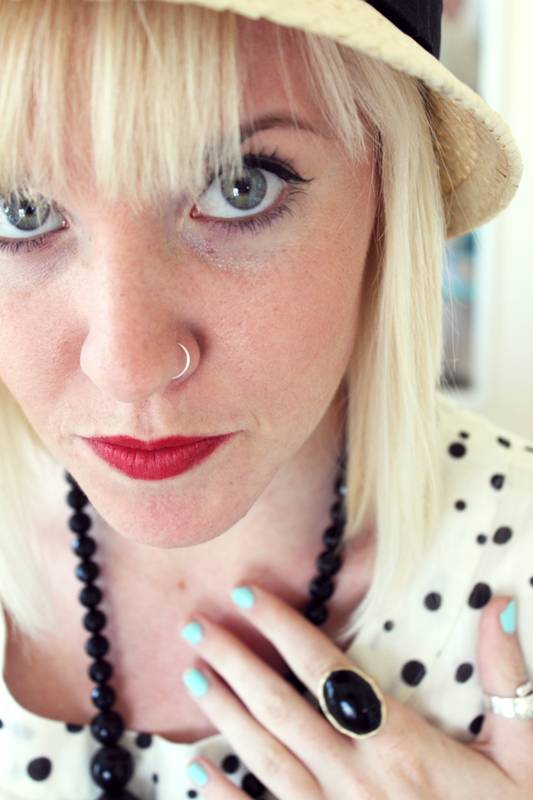 I love your polka dot top with the necklace. The last picture is adorable. Love this! Your blog is awesome, and gathering new music is exactly what I need to do right now. Awesome styling, too. the spots and wedges are AWESOME! Thank you for the nice comment on my blog! Great hat and necklace! This is such a cute look! That hat looks amazing on you too… I could never pull that off. loving your looks! 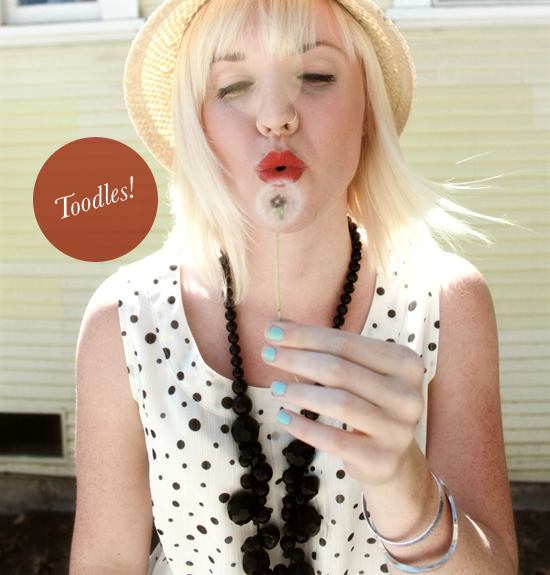 thanks for stopping by our blog…we’ll be checking yours out frequently…your just so darn cute! 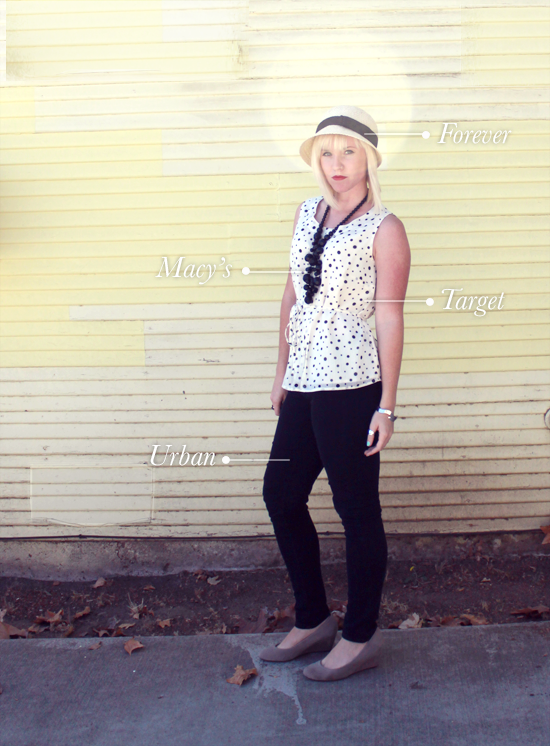 I really love the peplum polka dot top! You look amazing! I love your polka dot top! You look adorable. OMG you are TOO cute in that hat! And LOVING on your blue nails darling! Really love your mint nail polish 🙂 Cute outfit as well! $100 Shopbop.com giveaway on my blog! I love this outfit! The hat is awesome and black skinnies are the best! I can’t believe I am just now finding your blog. I am your newest follower! How cute!! Love ur blog!! Love the little polka dot peplum blouse, so cute! You look so cute! You have a beautiful blog! This outfit is great. I love hats- yours is too cute! Same with the necklace. And the top. And your makeup & nails! Love the color palette you provide. Such a fun and free outfit. i cannot stop listening to blood orange’s “coastal grooves”…. so good! Just checked your design portfolio-amazing work dear! I’m a graphic designer myself and it always so inspiring to see work like yours! LOVE all your details – everything is so perfect, from your accessories down to your lipstick color! LOVE it! i love that top, such a cute outfit! thanks for dropping by on our blog, would you like to follow each other? maybe on twitter? This is the most adorable outfit! Well I do think I just found another fav blog to read!!! You’ve got super fun style, are a delight to read, and take really cute pics 🙂 Way to rock the peplum look, but in a more relaxed style…and the hat is just so fetching on you! I’m so glad you found my blog because I love yours & your style! Cute outfit! I love the necklace. Love that dandelion picture! So pretty! I love what you’re wearing! this is adorable. love it all!! Love this top so much! Can never go wrong with the polka dots. Thanks for your lovely comment on my blog! Yours is absolutely fabulous, as well.